Dialects: Koyra Chiini, Djenné Chiini. The main dialect division is between Timbuktu and the upriver towns from Diré to Niafunké. A very distinct dialect is in Djenné City. Closely related languages: Koyraboro Senni Songhay, Humburi Senni Songhay, Zarma, Dendi. Lexical similarity: 77% between Gao and Timbuktu dialects, 50% lexical similarity with Tadaksahak. Koyra Chiini is a Songhay language spoken along the Niger River in northern Mali. 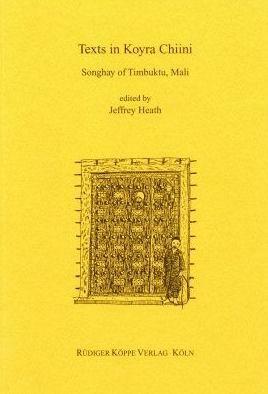 This volume contains texts from the fabled city of Timbuktu (152 pp. ), a nearby village (24 pp. ), and the town Niafunké (94 pp.). It also includes 118 pages of texts in Djenné Chiini, a closely related variety spoken in the enclave city of Djenné. The transcriptions respect dialectal variations.